Opis ebooka Be Stress Free - Tiziana M.
To learn how to manage stress, we must learn how to cope and reduce stressors.However, some of these stressors are encouraging. When you join in activities forexample, you often have fun. Still, stress mounts. Therefore, after enjoying activities thebest way to thrive on this positive stress is to relax. Relaxation comes from reclining andenjoying something that brings you happiness. For instance, you may relax by watching ahealthy program on television, read a book, or just simply recline.When you take time to relax you, reduce stress by lessening up the stressors. On the otherhand, when you are stressed from lack of foodstuff, this is unhealthy stress. You have thewillpower to take control however by accumulating resources. Instead of letting the stresswear you down, take action. Call resources in your area to see if you have options ingetting foodstuff to feed your family. Family community centers, welfare programs andother resources can offer you link to managing your problem. This will help you reducestress by slacking up on stressors. Opinie o ebooku Be Stress Free - Tiziana M.
Fragment ebooka Be Stress Free - Tiziana M.
taking action instead of letting stress get you down. you brain to get rid of the stress. stress so if your stressed you are doing something healthy for your body. sufficient foodstuff, water, or when we feel overworked, it causes stress to increase. To learn how to manage stress, we must learn how to cope and reduce stressors. healthy program on television, read a book, or just simply recline. stress by slacking up on stressors. can apply for to increase your income. experiences in your past, practice some helpful therapeutic techniques to take control. do to accomplish your goals. 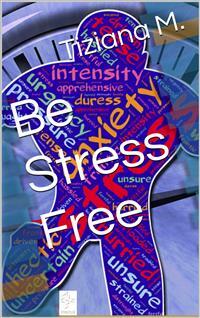 each stressor when you are thriving on stress to accomplish blossoming into a new you. stress and to control your life. the right path to a healthier you. that is a good way to get rid of the stress, as well as get in sharp. do something about it so this is a good thing for you. conquer depressive states that emerge from unattended stress relief. In order to be force free you have thrive on the stress that accumulates in your daily life. months you put into thriving on stress will payoff. What are some of the things I can do to habituate my brain to be tension free? are many ways to train you gray matter to get rid of the stress. will feel the stress relax. learn to do something about it so this is a good item for you. millions of people to find solutions and a guide to thriving on stress. you with thriving on stress. Learn some principles in thriving on stress. people have anything good to say. Most people have no clue what stress can do for them. What things do people do if they are stress out? bad either reading is good for you. How do I learn to benefit from having stress? no means but you can do it if you put your mind to it. How will I benefit from stress? to learn to do this. guide to thriving on stress. no control of except we can learn to make good decisions on how to handle the pressure. We endure stress in the home, workplace, and in our personal overall life. writing, exercise, and set goals to guide you in finding relief from stress. often find relaxation more often. we now have two things causing us stress making it harder to meet the first deadline. are being stressed over multi-tasking. Learn to think positive for meeting the deadline and tell yourself that you can do this. The deadline will be met if you clear stress, then you have time to finish the next task. You can only deal with one thing at a time. later it will look different and help you to handle it differently once it is out in the open. weight. Are going to lose weight by starting an exercise program?